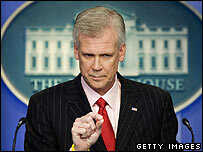 White House spokesman Tony Snow has announced that he is resigning from the job early for financial reasons. Mr Snow did not give the date he would leave but said he had taken a pay cut since he joined President George Bush's team from Fox News TV in April 2006. He has also been undergoing chemotherapy for colon cancer. His announcement comes just days after one of Mr Bush's closest advisers, Karl Rove, announced that he was leaving at the end of the month. Mr Snow announced his intentions on the conservative radio programme The Hugh Hewitt Show. "I've already made it clear I'm not going to be able to go the distance, but that's primarily for financial reasons," he said. "I've told people when my money runs out, then I've got to go." Mr Snow had joined the White House in April 2006, at a time when Mr Bush was increasingly under fire for the wars in Iraq and Afghanistan. Doctors discovered in March a recurrence of his colon cancer which forced Mr Snow to undergo chemotherapy. Mr Bush has lost some of his closest advisors in recent months. The latest was his top strategist, Karl Rove, who said he would quit at the end of the month. Other aides have left since the Democrats took control of Congress in January 2007. They include counsellor Dan Bartlett, chief White House attorney Harriet Miers, budget director Rob Portman, political director Sara Taylor, deputy national security adviser J.D. Crouch and Meghan O'Sullivan, another deputy national security adviser who worked on Iraq.